So as you know, I like to keep track of my empties, which products I have been using up over the previous weeks/months and what I thought about them. Today I thought it might be cool to talk about just the holiday empties which I acquired. I recently went away to Lanzarote for two weeks with my family and Josh, now that’s a decent amount of time so I did expect that I would be able to finish some products up. Some are a little different to my usual choices, because no one wants to take their most expensive products away with them, in case you have to leave them behind to keep under the weight allowance. I am trying really hard to cut down on my plastic consumption, but sometimes it’s hard to get cheap travel toiletries which are “naked” and I also needed to be sure they would last myself and Josh 2 weeks! So I did end up picking up plastic bottles, but what’s great about the fact that I used these up on holiday is that the complex we stayed in had an excellent recycling scheme for all of the bottles. They were also even collecting the lids, which normally are classed as non-recyclable, for a charity scheme, so non went into the normal rubbish. So onto which products I actually managed to use up. No surprise, sun cream featured heavily. It was always going to happen we were away in up to 30 degree heat, for two weeks and we are both pale as can be. So we managed to use up 3 bottles of the stuff, 2 factor 30 and 1 factor 50. 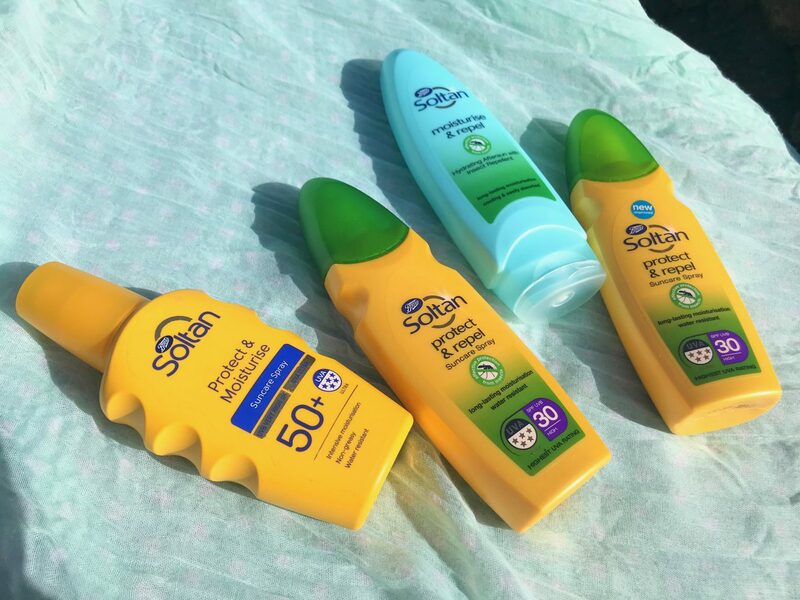 The bottles are just different because Soltan has recently repackaged, it’s the same product just with a newer shaped bottle. So the 2 bottles of Protect and Repel were both left over from our last trip away to Barcelona. Basically it’s just sun cream with insect repellent already in the formula, but it worked because I didn’t get bitten once in a fortnight so I can’t complain there. The other is just the protect and moisture range- basically it just has no repellent in it. 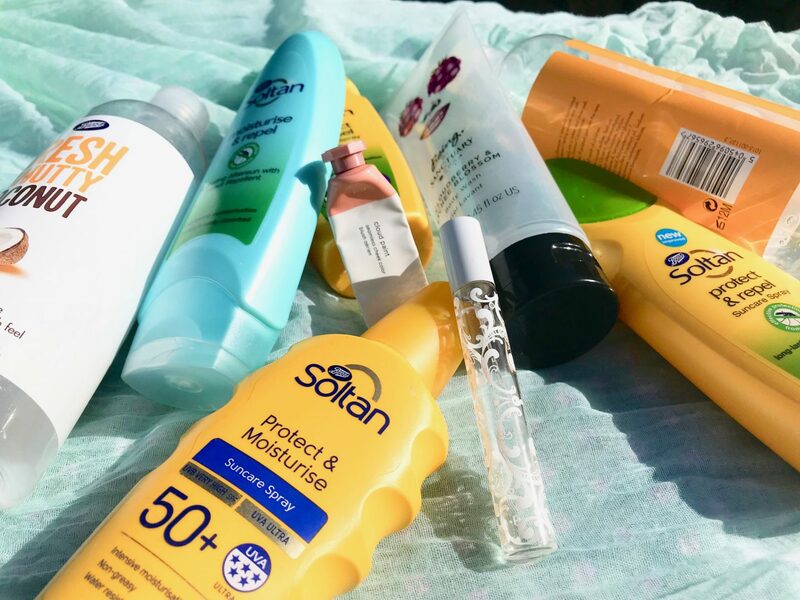 What I like about Soltan is that, for a start it’s cheap but also it actually has the highest UVA/UVB rating you can get. Each are rated 5 stars, which is 1 or 2 stars higher than other leading brands. Just something to be aware of when you’re buying SPF, look for the highest amount of stars (up to 5) to tell you your level of protection. 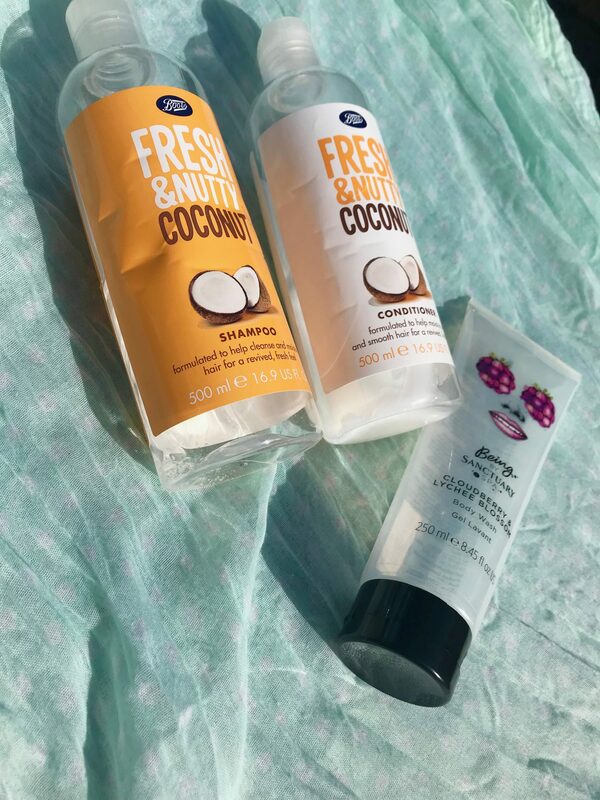 Alongside these, I also used up a bottle of the Soltan moisturise and repel Aftersun, which is just a cooling cream, again with the repellent included. I also used up a couple of smaller items whilst I was away, one of which is the Glossier Cloud Paint in the shade Dusk. I wore the cream blush near enough every evening whilst I was on holiday. It’s the perfect blush if you don’t want to look obviously ‘pink’, I think it also helped me look a bit more tanned. I cannot recommend this blush enough, I am pale but I don’t feel like the effect is too much as long as I apply it with a sponge or with my fingertips, and I already have a back up bottle ready to go because I love it that much! This was already well over half-way to being used up when I went to Lanzarote, you don’t need much so to use a whole bottle would have been slightly ridiculous. The other miniature item I used up was my travel size bottle of the perfume Kat Von D Saint, Josh kindly bought this for me when we were in Barcelona in October. 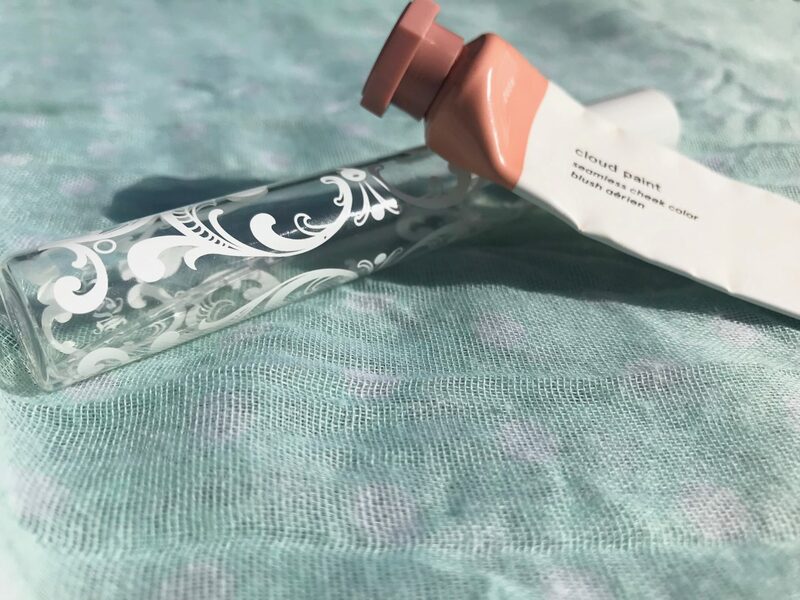 It has lived in my handbag ever since and I just finished it up on holiday- so I think that shows how well this has lasted considering it has been used multiple times a week for cracking on 6 weeks. This is the perfect daytime fragrance for me as I don’t need to top it up (I always forget when I’m busy), it’s sweet but not sickly and it’s just really different to any other fragrance that I own. The best part about it? It’s cruelty-free which is so hard to find when looking for perfumes! I also used up a whole shower gel whilst in Lanzarote, I had expected this because we were sharing between us, so I took a full size brand new bottle. I decided to pack the Being by Sanctuary Body Wash in the Cloudberry and Lychee Blossom scent. It came in a Christmas gift set and I had saved it to take away because it had such a holiday smell! There’s not really too much to say as it’s a body wash but it smelled nice, it lathered up well and I would happily use it again in the future. I do really enjoy using the Being by Sanctuary products though, the scents seem to pack a punch and I like what the brand represents- have a look at their Instagram to see what I mean. Talking of shower stuff, obviously I went through a bottle of shampoo and conditioner. There’s something about being on holiday that makes my hair drink up moisture like it’s gong out of fashion, so I opted for coconut, as it’s known for it’s hydrating qualities. These are the boots own range and cost 90p- you really can’t complain at the bargain price and these were actually better than expected. Granted they don’t leave my hair feeling it’s absolute best, but when there’s a risk you might leave all your toiletries behind at the hotel these work nicely. I can’t actually find these on the website but they were in store last time I checked. So there you have it, just a few items I managed to finish up whilst abroad. I just thought it would make a change to do this as a holiday focussed post as it means I can see what I need most of, which will help me when packing in future. Thanks for reading, let me know in the comments below whether you have used any of these products or what your most common holiday empty is?